Uganda is blessed with beautiful ever green forests where different tourism activities like nature walks or forest walks are conducted. The country Uganda has various stunning, unexplored forest reserves attracting many Eco-tourists and researchers to undertake tours and safaris to Uganda mainly to enjoy different interesting activities offered in these forest sites. The remarkable forest reserves where visitors on Uganda safaris can enjoy nature walks include the endowed Budongo Forest located in north western Uganda and also formatting part of the Murchison falls conservation area. The forest is one vast forest reserves where travelers on safaris to Uganda interested in having nature walks can enjoy their trip. Participating in the nature trails in the forest reserve offers rare chance for visitors to view different primate species such as the human cuisines i.e. Chimpanzees as well as red and black colobus, monkeys, among others. Besides the primates the interesting nature walk through the dense ever green tree species in the forest enable the visitors to have an encounter with different forest bird species such as white-thighed horn-bill as well as species of puvel’s illadopsis housed in the forest. 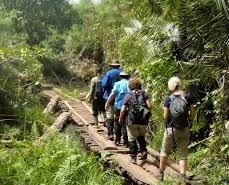 The other recommendable forest reserve where one can enjoy nature walks while on his or her safari tour to Uganda is Mabira Forest which is just located mere 54km from Kampala Uganda’s capital city along Kampala –Jinja route. The green thick Mabira Forest can be explored discovered through participating in one of the extensive nature trails. The trails leads visitor to the middle parts of the forest where one can enjoy the cool serene environ, together with watching different bird species which are surviving in the forest reserve. The other activities which add up the experience in the forest is the cycle biking and birding. Mpanga Forest Reserve is one recommendable Eco-tourism site where one can have relaxed nature walk .the site is situated in the 37 kilometers distance on western part of Uganda. The trails in the tea gardens offer an added opportunity for visitors on their gorilla trekking safaris in Uganda’s Bwindi to link to the Eco –tourism Center to enjoy experiential tourism activities.